A German firm has released a 150 Euro add-on for the iPad enabling you to watch digital terrestrial signals on the iPad's screen. 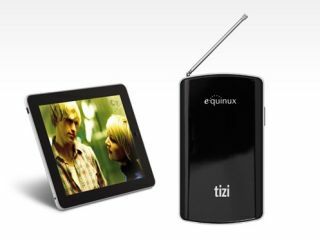 Equinux's Tizi box will work with iPhone and iPad touch, too, while you can rapidly swipe to flick through channels. Elgato's EyeTV also enables you to do the same on iOS, but it needs your computer to be on to dish out the signals. And then, of course, there's TV Catchup which you can use to stream TV for free in the UK. Tizi is a separate black box that can be charged via USB - it beams the signals to your iOS device over Wi-Fi using its own peer-to-peer wireless network. The downside of this is that you'll lose your internet connection while you're watching TV, so should you want to pop and check Twitter quickly, you won't be able to. The box doesn't have a wall coaxial connection, instead it features a flexible extendible antenna that was specially developed from a malleable metal alloy to improve reception. Tizi delivers DVB-T/DTT/TNT programmes wirelessly for up to 3.5 hours. You simply turn on the device and connect to its wireless network from the iPad. A free Tizi app is available to actually watch the broadcasts - this is fully compatible with iOS multitasking.